Lower urinary tract symptoms (LUTS) are highly prevalent in men and the incidence increases with age . LUTS is usually considered a synonym for benign prostatic hyperplasia (BPH). However, only 25% to 50% of men with BPH have LUTS, and urodynamically-proven bladder outlet obstruction (BOO) is only seen in 50% of men with LUTS . Clinically, the diagnosis of BPH and BOO is usually made based on a total prostate volume (TPV) >40 mL, and a maximum flow rate (Qmax) <10 mL/s, in combination with a high International Prostate Symptom Score (IPSS) . Many clinical studies have demonstrated that LUTS have poor diagnostic specificity for BOO and the symptoms of some patients with LUTS/BPH do not improve after transurethral resection of the prostate (TURP) . Although an enlarged prostate might not indicate the presence of BOO, the mean TPV of patients with BOO is significantly greater than that of patients without BOO . In addition, patients with LUTS/BPH and a Qmax of <10 mL/s have a greater improvement in the Qmax after TURP compared with those with a Qmax >10 mL/s. Patients without urodynamic evidence of BOO may have a poor surgical outcome after TURP . In one study, patients with persistent LUTS after TURP were found to have a small TPV at the time of surgery, suggesting that a non-BPH etiology might account for their LUTS . Therefore, diagnosis of clinical BPH should be undertaken carefully, especially when an invasive procedure such as TURP is going to be performed. The differential diagnosis for non-BPH lower urinary tract dysfunction (LUTD) is important in the management of LUTS/BPH. The focus on LUTS has recently shifted from the prostate to the bladder . Several investigations suggest that not all male LUTS are associated with prostate pathology or BOO and bladder dysfunction plays a role in the pathogenesis. However, it is difficult to distinguish the causes of male LUTS based on clinical symptoms, and a subset of patients receiving treatment for prostatic conditions may have residual overactive bladder (OAB) symptoms ,,. Although urodynamic pressure flow study is helpful in the differential diagnosis, the equipment is not available in every clinic. The pathophysiology of male LUTS could be bladder dysfunction, (including hypersensitive bladder, detrusor overactivity [DO], detrusor hyperactivity and inadequate contractility [DHIC]), BOO (including bladder neck dysfunction [BND], prostatic obstruction, urethral stricture, poor relaxation of the urethral sphincter), or a combination of these etiologies. It has been estimated that only 48%–53% of men with LUTS have urodynamically-proven BOO due to BPH or other bladder outlet dysfunctions . In addition, approximately 50%–75% of patients with BOO have OAB symptoms ,, and 46 to 66% of patients with BPO on urodynamics have DO ,. The practice guidelines of the both the European Association of Urology and the American Urological Association (AUA) recommend that evaluating symptom severity with a symptom score is an important part of the assessment of male LUTS ,. The IPSS and American Urological Association Symptom Index (AUA-SI) have been widely used for decades in many languages to evaluate the severity of LUTS/BPH, and have been applied to other conditions causing LUTS for comparison of treatment outcomes. Measuring the IPSS-storage (IPSS-S) and IPS-voiding (IPSS-V) subscores separately and using the IPSS-V/S ratio can help differentiate bladder- and urethra-related conditions . We have previously constructed an IPSS voiding to storage (IPSS-V/S) ratio for differential diagnosis of bladder and bladder outlet dysfunction. An IPSS-V/S <1.0 was noted in 80% of patients with bladder-related LUTS and an IPSS-V/S >1.0 was seen in 76% of patients with BPH-BOO and non-BPH voiding dysfunction. Alpha-blockers and 5-alpha-reductase inhibitors (5ARIs) are effective in the treatment of men with BOO due to BPH or non-BPH voiding dysfunction. These agents may not be effective treatment for storage symptoms . Antimuscarinic or anticholinergic agents are the first-line treatment for patients with OAB . According to the initial differential diagnosis and medication given, 75% of patients with bladder-related conditions (IPSS-V/S <1) and 80% of those with urethral-related conditions (IPSS-V/S >1) reported improved outcomes after medical treatment with antimuscarinic agents and alpha-blockers, respectively . Further urological investigations can be reserved for those with failed initial treatment based on the IPSS-V/S ratio. Alpha-blockers have been considered the first choice for men with voiding or storage LUTS. Antimuscarinic agents usually are not prescribed as the first-line medication because acute urinary retention is possible. Combined therapy with an alpha-blocker and antimuscarinic agent may be the choice for male patients with storage LUTS . Recent study revealed that combined treatment with tolterodine ER plus tamsulosin resulted in significantly greater improvement in LUTS than placebo or either active medication alone . However, it is not reasonable or cost effective for doctors to prescribe both medications for men with storage LUTS alone. If we can use the IPSS-V/S ratio as a screening tool to prescribe first-line medication, most patients will improve. Those who do not respond should have further urological investigation. BPH is highly prevalent in older men. However, it has been estimated that only 25%–50% of men with BPH have LUTS, and only 50% of men with LUTS have urodynamically-proven BOO due to BPH or another bladder outlet dysfunction . Previous studies have shown weak correlations of LUTS with prostate size, uroflow measures and pressure flow study data ,,,. Nevertheless, the AUA-SI was found effective in predicting BPH progression to surgery . The symptom score is better for quantifying symptoms for the evaluation of BPH treatment than for diagnosis of BPH . Although BPH is one of the most common diseases in elderly men, not all LUTS are caused by BPH. BPH with BOO was only found in one third of a cohort of patients with both storage and voiding LUTS . In fact, LUTS can be the clinical presentation of OAB or BOO in both men and women, and in the elderly and children. Using a LUTS symptom score such as the IPSS or AUA-SI as a diagnostic tool for BOO or BPH could be inappropriate and lead to an incorrect therapeutic strategy. The prostatic specific antigen (PSA) level is indicated in all men with LUTS and an enlarged prostate or abnormal digital rectal examination (DRE) finding. Men with high PSA levels have a higher risk of future growth of the prostate, symptom and flow rate deterioration, acute urinary retention and BPH-related surgery ,,. PSA levels increase with age , and approximately 25% of men with BPH have a PSA level of >4 ng/mL . Uroflowmetry for Qmax and the post-void residual (PVR) should be measured concomitantly. However, uroflow study has poor diagnostic specificity for BOO ,. Bladder sonography is indicated to measure the PVR and investigate bladder stones, bladder wall thickness, and intravesical prostate protrusion. Patients with an estimated bladder mass weight greater than 35 g on sonography were 13.4% times more likely to develop acute urinary retention than patients with a lower bladder weight . A significant correlation between bladder wall trabeculation and the grade of BOO has been reported ,. A high rate of intravesical prostatic protrusion (IPP) has been associated with a higher risk of treatment resistance, acute urinary retention, and the need for prostatic surgery in patients receiving dutasteride treatment for symptomatic BPH. Dutasteride might not be effective for IPP reduction ,. Recently, a greater prostatic urethral angulation was found to associate with a lower Qmax . Similarly, patients with a higher bladder neck elevation angle (≥35°) had a higher BOO index and more obstructed voiding patterns than those with a lower bladder neck elevation angle . Urethral closure pressure had a significant positive linear correlation with the Abrams–Griffiths number and had a strong association with BOO. Micturition urethral pressure profilometry was able to localize the site of obstruction in patients with BOO . Therefore, urethrocystoscopy and urodynamic study can be considered in cases of invasive treatment, recurrent incontinence and specific situations . These clinical investigations can help in the diagnosis of male LUTS/BPH. Urodynamic Study – Do Men With Lower Urinary Tract Symptoms Need Urodynamic Study Before Surgical Intervention? The diagnostic rationale of urodynamic study in association with the currently changing management paradigm of LUTD has been debated for long time. Surgical intervention to relieve BOO and LUTS based on urodynamic diagnosis resulted in improvement in the flow rate after TURP . Preoperative urodynamic diagnosis of DO was associated with significantly more storage LUTS requiring antimuscarinic treatment after prostate surgery than that seen in patients without DO  In patients with OAB symptoms and failed empirical treatment, urodynamic study can provide definite information that can identify associated pathologies and/or alter the treatment course . In patients with detrusor underactivity (DU), diminished bladder sensation to volume increase was noted in nonobstructive, nonneurogenic symptomatic patients . A retrospective study of urodynamic studies in men with OAB symptoms revealed that most of these patients also had voiding symptoms and 43% of them had BOO . Urodynamic studies are useful in the evaluation of LUTD in patients with BOO and DU, especially when invasive treatments are being considered . A systemic review of the diagnostic value of office-based tests for BOO in men with LUTS revealed that individual symptoms and questionnaires for diagnosing BOO are not significantly associated with each other. An IPSS score cutoff of 20 or greater increased the likelihood of BOO . Invasive urodynamic study did change decision making in the management of male LUTS/BPH. However, men who received urodynamic study were less likely to undergo surgery as treatment for voiding LUTS . Pressure flow study provides valuable information on detrusor function and bladder outlet dysfunction. However, urodynamic study also can result in morbidity, such as urinary tract infection in 4%–6% of patients and dysuria in 75% of men with BOO and 55% of men without BOO . Although pressure flow study can establish the diagnosis of BOO, the symptomatic outcome of treatment for BPH did not differ among different degrees of BOO . Videourodynamic study (VUDS) provides a more accurate diagnosis of benign prostatic obstruction (BPO) and other bladder and urethral dysfunctions responsible for LUTS . In patients with both storage and voiding LUTS, the incidence of DO and DHIC increases with age, whereas the incidence of poor relaxation of the urethral sphincter is seen more often in younger patients . A diagnostic algorithm for LUTS/BPH may aid in determining the therapeutic strategy . In the initial assessment, the history, IPSS, DRE, uroflowmetry and PVR provide information for the diagnosis of BPO and non-BPO. 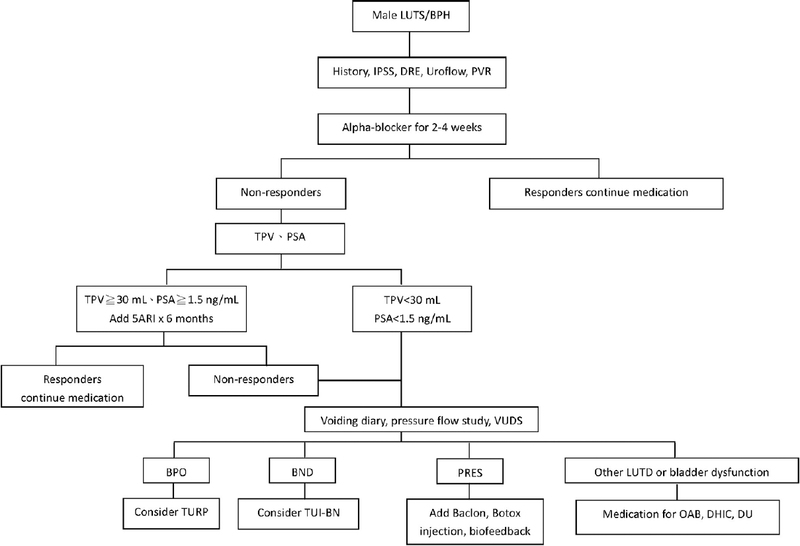 Short-term alpha-blockers can be used for patients with LUTS/BPH for 2–4 weeks . If patients do not respond to initial treatment, measurement of the TPV and PSA should be done and 5ARIs such as dutasteride or finasteride can be added in the presence of an enlarged prostate (TPV >30 mL) ,. If patients do not respond to combination therapy for 6 months, a voiding diary (for nocturnal polyuria), pressure flow study (for DO or DU), or VUDS (to confirm the presence of BPO and BND or poor relaxation of the urethral sphincter) should be carried out to investigate diagnoses other than BPO. Cystoscopy may be an additional procedure to diagnose urethral stricture, bladder stones, or other urethral lesions. Surgical intervention for BPH should be considered only when a diagnosis of BPO has been clearly established [Figure 1]. Traditionally, male LUTS has been considered a synonym for BPH because most male LUTS develops in aging men. Recent investigations have revealed that bladder dysfunction and bladder outlet dysfunction contribute equally to male LUTS. BPH comprises only one-third of male LUTS. In patients with a TPV of less than 40 mL, diagnosis of bladder dysfunction such as hypersensitive bladder, DO, DHIC, or DU should be considered, whereas BND and poor urethral sphincter relaxation should also be kept in mind in younger men. The IPSS V/S ratio can be used by general physicians for the first line diagnosis and medication can be prescribed without uroflowmetry or prostatic ultrasound examinations. Only patients who do not respond to initial treatment should be referred for further urological investigations. Male LUTS is a complicated symptom syndrome. It involves different disorders of the urinary bladder and the bladder outlet. Male LUTS should not be considered as merely one simple disease – BPH. Diagnosis and treatment of male LUTS is precision medicine. Urologists should take a detailed history, and perform a physical examination, laboratory investigations, symptom evaluation, transrectal sonography of the prostate and bladder, uroflowmetry, cystoscopy, or urodynamic study to make an accurate diagnosis. Life style modification and medical treatment should be used first, with surgical treatment reserved for patients with failed initial management. Milsom I, Abrams P, Cardozo L, Roberts RG, Thüroff J, Wein AJ. How widespread are the symptoms of an overactive bladder and how are they managed? A population-based prevalence study. BJU Int 2001;87:760-6. Eckhardt MD, van Venrooij GE, Boon TA. Symptoms, prostate volume, and urodynamic findings in elderly male volunteers without and with LUTS and in patients with LUTS suggestive of benign prostatic hyperplasia. Urology 2001;58:966-71. Boyle P, Gould AL, Roehrborn CG. Prostate volume predicts outcome of treatment of benign prostatic hyperplasia with finasteride: Meta-analysis of randomized clinical trials. Urology 1996;48:398-405. Neal DE, Ramsden PD, Sharples L, Smith A, Powell PH, Styles RA, et al. Outcome of elective prostatectomy. BMJ 1989;299:762-7. Chen JL, Kuo HC. Implications of prostatic volume measurements on the degree of bladder outlet obstruction in men with benign prostatic prostatic hyperplasia and lower urinary tract symptoms. JUTA 2006;17:41-7. Kuo HC, Tsai TC. Assessment of prostatic obstruction and bladder function by urodynamic pressure flow study. J Formos Med Assoc 1987;86:1084-92. Kuo HC. Analysis of the pathophysiology of lower urinary tract symptoms in patients after prostatectomy. Urol Int 2002;68:99-104. Chapple CR, Roehrborn CG. A shifted paradigm for the further understanding, evaluation, and treatment of lower urinary tract symptoms in men: Focus on the bladder. Eur Urol 2006;49:651-8. Lee JY, Kim HW, Lee SJ, Koh JS, Suh HJ, Chancellor MB. Comparison of doxazosin with or without tolterodine in men with symptomatic bladder outlet obstruction and an overactive bladder. BJU Int 2004;94:817-20. Ignjatovic I. Symptoms and urodynamics after unsuccessful transurethral prostatectomy. Int Urol Nephrol 2001;32:655-8. Irwin DE, Milsom I, Hunskaar S, Reilly K, Kopp Z, Herschorn S, et al. Population-based survey of urinary incontinence, overactive bladder, and other lower urinary tract symptoms in five countries: Results of the EPIC study. Eur Urol 2006;50:1306-14. Ameda K, Sullivan MP, Bae RJ, Yalla SV. Urodynamic characterization of nonobstructive voiding dysfunction in symptomatic elderly men. J Urol 1999;162:142-6. Fusco F, Groutz A, Blaivas JG, Chaikin DC, Weiss JP. Videourodynamic studies in men with lower urinary tract symptoms: A comparison of community based versus referral urological practices. J Urol 2001;166:910-3. Hyman MJ, Groutz A, Blaivas JG. Detrusor instability in men: Correlation of lower urinary tract symptoms with urodynamic findings. J Urol 2001;166:550-2.
de la Rosette JJ, Alivizatos G, Madersbacher S, Perachino M, Thomas D, Desgrandchamps F, et al. EAU Guidelines on benign prostatic hyperplasia (BPH). Eur Urol 2001;40:256-63. AUA Practice Guidelines Committee. AUA guideline on management of benign prostatic hyperplasia (2003). Chapter 1: Diagnosis and treatment recommendations. J Urol 2003;170(2 Pt 1):530-47. Liao CH, Chung SD, Kuo HC. Diagnostic value of international prostate symptom score voiding-to-storage subscore ratio in male lower urinary tract symptoms. Int J Clin Pract 2011;65:552-8. Andersson KE. Antimuscarinics for treatment of overactive bladder. Lancet Neurol 2004;3:46-53. Liao CH, Lin VC, Chung SD, Kuo HC. Therapeutic effect of α-blockers and antimuscarinics in male lower urinary tract symptoms based on the International Prostate Symptom Score subscore ratio. Int J Clin Pract 2012;66:139-45. Chapple C. Antimuscarinics in men with lower urinary tract symptoms suggestive of bladder outlet obstruction due to benign prostatic hyperplasia. Curr Opin Urol 2010;20:43-8. Kaplan SA, Roehrborn CG, Rovner ES, Carlsson M, Bavendam T, Guan Z. Tolterodine and tamsulosin for treatment of men with lower urinary tract symptoms and overactive bladder: A randomized controlled trial. JAMA 2006;296:2319-28. Abrams P. Benign prostatic hyperplasia. Poorly correlated with symptoms. BMJ 1993;307:201. Andersen JT. Benign prostatic hyperplasia: Symptoms and objective interpretation. Eur Urol 1991;20 Suppl 1:36S-40S. Chapple CR, Noble JG, Milroy EJ. Comparative study of selective alpha 1-adrenoceptor blockade versus surgery in the treatment of prostatic obstruction. Br J Urol 1993;72(5 Pt 2):822-5. Frimodt-Møller PC, Jensen KM, Iversen P, Madsen PO, Bruskewitz RC. Analysis of presenting symptoms in prostatism. J Urol 1984;132:272-6. Roehrborn CG, McConnell JD, Saltzman B, Bergner D, Gray T, Narayan P, et al. Storage (irritative) and voiding (obstructive) symptoms as predictors of benign prostatic hyperplasia progression and related outcomes. Eur Urol 2002;42:1-6. Gacci M, Bartoletti R, Figlioli S, Sarti E, Eisner B, Boddi V, et al. Urinary symptoms, quality of life and sexual function in patients with benign prostatic hypertrophy before and after prostatectomy: A prospective study. BJU Int 2003;91:196-200. Rosen R, Altwein J, Boyle P, Kirby RS, Lukacs B, Meuleman E, et al. Lower urinary tract symptoms and male sexual dysfunction: The multinational survey of the aging male (MSAM-7). Eur Urol 2003;44:637-49. Roehrborn CG, McConnell J, Bonilla J, Rosenblatt S, Hudson PB, Malek GH, et al. Serum prostate specific antigen is a strong predictor of future prostate growth in men with benign prostatic hyperplasia. PROSCAR long-term efficacy and safety study. J Urol 2000;163:13-20. Roehrborn CG, Bruskewitz R, Nickel GC, Glickman S, Cox C, Anderson R, et al. Urinary retention in patients with BPH treated with finasteride or placebo over 4 years. Characterization of patients and ultimate outcomes. The PLESS Study Group. Eur Urol 2000;37:528-36. Roehrborn CG. Focus on lower urinary tract symptoms: Nomenclature, diagnosis, and treatment options: Highlights from the 5th international consultation on benign prostatic hyperplasia June 25-27, 2000, Paris, France. Rev Urol 2001;3:139-45. Oesterling JE, Jacobsen SJ, Chute CG, Guess HA, Girman CJ, Panser LA, et al. Serum prostate-specific antigen in a community-based population of healthy men. Establishment of age-specific reference ranges. JAMA 1993;270:860-4. Polascik TJ, Oesterling JE, Partin AW. Prostate specific antigen: A decade of discovery – What we have learned and where we are going. J Urol 1999;162:293-306. Nielsen KK, Nordling J, Hald T. Critical review of the diagnosis of prostatic obstruction. Neurourol Urodyn 1994;13:201-17. Abrams P, Schäfer W, Tammela TL, Barrett DM, Hedlund H, Rollema HJ, et al. Improvement of pressure flow parameters with finasteride is greater in men with large prostates. Finasteride Urodynamics Study Group. J Urol 1999;161:1513-7. Miyashita H, Kojima M, Miki T. Ultrasonic measurement of bladder weight as a possible predictor of acute urinary retention in men with lower urinary tract symptoms suggestive of benign prostatic hyperplasia. Ultrasound Med Biol 2002;28:985-90. Ezz el Din K, Kiemeney LA, de Wildt MJ, Debruyne FM, de la Rosette JJ. Correlation between uroflowmetry, prostate volume, postvoid residue, and lower urinary tract symptoms as measured by the international prostate symptom score. Urology 1996;48:393-7. Ochiai A, Kojima M. Correlation of ultrasound-estimated bladder weight with ultrasound appearance of the prostate and postvoid residual urine in men with lower urinary tract symptoms. Urology 1998;51:722-9. Wang D, Huang H, Law YM, Foo KT. Relationships between prostatic volume and intravesical prostatic protrusion on transabdominal ultrasound and benign prostatic obstruction in patients with lower urinary tract symptoms. Ann Acad Med Singapore 2015;44:60-5. Yoshida T, Kinoshita H, Yoshida K, Mishima T, Taniguchi H, Yanishi M, et al. Intravesical prostatic protrusion as a predicting factor for the adverse clinical outcome in patients with symptomatic benign prostatic enlargement treated with dutasteride. Urology 2016;91:154-7. Bang WJ, Kim HW, Lee JY, Lee DH, Hah YS, Lee HH, et al. Prostatic urethral angulation associated with urinary flow rate and urinary symptom scores in men with lower urinary tract symptoms. Urology 2012;80:1333-7. Kang M, Kim M, Choo MS, Bae J, Ku JH, Yoo C, et al. Association of high bladder neck elevation with urodynamic bladder outlet obstruction in patients with lower urinary tract symptoms and benign prostatic hyperplasia. Urology 2014;84:1461-6. Jain S, Agarwal MM, Mavuduru R, Singh SK, Mandal AK. Micturitional urethral pressure profilometry for the diagnosis, grading, and localization of bladder outlet obstruction in adult men: A comparison with pressure-flow study. Urology 2014;83:550-5. Mathieu R, Benchikh A, Azzouzi AR, Campeggi A, Cornu JN, Delongchamps NB, et al. Initial assessment of male non-neurogenic incontinence: Systematic review of the literature by the LUTS committee of the French Urological Association. Prog Urol 2014;24:421-6. Gnanapragasam VJ, Leonard A. Does a pre-operative urodynamic diagnosis of bladder outflow obstruction improve outcomes from palliative transurethral prostatectomy? Urol Int 2011;86:85-9. Monoski MA, Gonzalez RR, Sandhu JS, Reddy B, Te AE. Urodynamic predictors of outcomes with photoselective laser vaporization prostatectomy in patients with benign prostatic hyperplasia and preoperative retention. Urology 2006;68:312-7. Rutman MP, Cha DY, Blaivas JG. How do urodynamics findings influence the treatment of the typical patient with overactive bladder? Curr Urol Rep 2012;13:370-8. Smith PP, Chalmers DJ, Feinn RS. Does defective volume sensation contribute to detrusor underactivity? Neurourol Urodyn 2015;34:752-6. Al-Zahrani AA, Gajewski JB. Association of symptoms with urodynamic findings in men with overactive bladder syndrome. BJU Int 2012;110(11 Pt C):E891-5. Gomes CM, Nunes RV, Araújo RM, Sacomani CR, Trigo-Rocha FE, Bruschini H, et al. Urodynamic evaluation of patients with lower urinary tract symptoms and small prostate volume. Urol Int 2008;81:129-34. D'Silva KA, Dahm P, Wong CL. Does this man with lower urinary tract symptoms have bladder outlet obstruction? The Rational Clinical Examination: A systematic review. JAMA 2014;312:535-42. Clement KD, Burden H, Warren K, Lapitan MC, Omar MI, Drake MJ. Invasive urodynamic studies for the management of lower urinary tract symptoms (LUTS) in men with voiding dysfunction. Cochrane Database Syst Rev 2015;4:CD011179. de la Rosette JJ, Witjes WP, Schäfer W, Abrams P, Donovan JL, Peters TJ, et al. Relationships between lower urinary tract symptoms and bladder outlet obstruction: Results from the ICS-”BPH” study. Neurourol Urodyn 1998;17:99-108. Witjes WP, Aarnink RG, Ezz-el-Din K, Wijkstra H, Debruyne EM, de la Rosette JJ. The correlation between prostate volume, transition zone volume, transition zone index and clinical and urodynamic investigations in patients with lower urinary tract symptoms. Br J Urol 1997;80:84-90. Kuo HC. Pathophysiology of lower urinary tract symptoms in aged men without bladder outlet obstruction. Urol Int 2000;64:86-92. Kuo HC. Videourodynamic analysis of pathophysiology of men with both storage and voiding lower urinary tract symptoms. Urology 2007;70:272-6. Artibani W. Integrating the patient risk profile in the management of lower urinary tract symptoms suggestive of benign prostatic hyperplasia (LUTS/BPH). Eur Urol Suppl 2004;3:1S-6S. Lepor H, Nieder A, Feser J, O'Connell C, Dixon C. Effect of terazosin on prostatism in men with normal and abnormal peak urinary flow rates. Urology 1997;49:476-80. Kaplan SA, Roehrborn CG, McConnell JD, Meehan AG, Surynawanshi S, Lee JY, et al. Long-term treatment with finasteride results in a clinically significant reduction in total prostate volume compared to placebo over the full range of baseline prostate sizes in men enrolled in the MTOPS trial. J Urol 2008;180:1030-2. Roehrborn CG, Siami P, Barkin J, Damião R, Major-Walker K, Nandy I, et al. The effects of combination therapy with dutasteride and tamsulosin on clinical outcomes in men with symptomatic benign prostatic hyperplasia: 4-year results from the CombAT study. Eur Urol 2010;57:123-31.